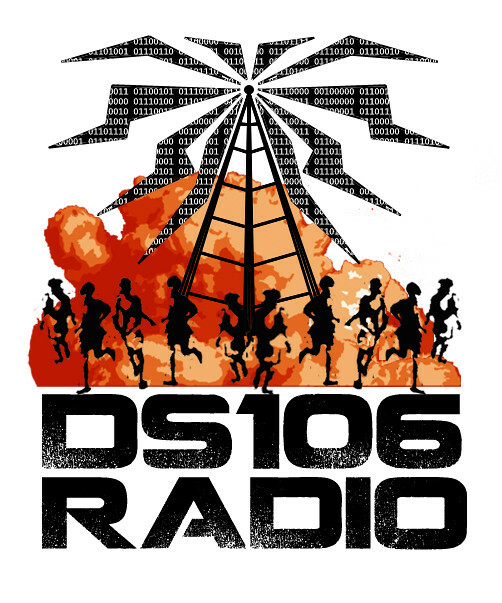 I made a design for ds106 radio. It could be a logo, or a poster, or a t-shirt, or a tattoo or an etc. There are binary lightning bolts, billowing smoke and children running away from the explosive force that is ds106 radio. This entry was posted in Uncategorized and tagged DesignAssignments, DesignAssignments50, ds106radio. Bookmark the permalink. Oh, I APPROVE. Spot on. I think it is time to order the shirts, hope you have a big, original image we can use! Also, is this free for us to use, creative commons, etc. The font is from dafont and is donationware, the people running and the smoke are creativecommons that are photoshopped out of recognition and I drew the tower and lightning bolts. So it’s all free to use. Unfortunately, I didn’t draw it big enough, so if you aren’t bluffing the t-shirts, I’ll need to do it over, bigger and better, but that won’t be a problem. I am absolutely not bluffing about the t-shorts, make it bigger. This is definitely going to be one of the class shirts for sure, and I hope to have mine (and all my family is getting one as well) sometime soon, so let’s go :) And you need to get some of that profit! awesome. where do I place my order for the t-shirt? I ran the image through Illustrator’s Rasterize tool. It’s not perfect, but it’s a vectorized version that should work at any size/resolution. As I was thinking about this change this morning, I started to record a bumper for ds106rad.io that would emphasize the new URL. As I was doing this, I liked the play on rad and io — rad for radical or rad, and io for input-output. The station and some of its participants CAN be radical, and certainly rad, and the synchronous / asynchronous interaction that occurs definitely reflects both input and output by the participants. Anyway, as I was recording, I started to thing about visualizing this as well. The next thing I knew, I was remixing your wonderful ds106radio logo into an animated GIF. I trust you see this as an homage to your wonderful design, and reflective of the spirit of ds106.